geliştiği bir Epidermolizis Bülloza (EB) tipidir. 1. Karaduman A. Kalıtsal büllü hastalıklar. Türkderm 2011;45(2):81-6. 2. Sousa MC, Paula CD, Tauil PL, Costa IM. Correlation between nutritional, hematological and infectious characteristics and classification of the type ofepidermolysisbullosa of patients assisted at the Dermatology Clinic of the Hospital Universitário de Brasília. An Bras Dermatol 2015;90(6):922-4. 3. Elluru RG, Contreras JM, Albert DM. 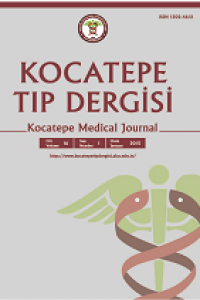 Management of manifestations of epidermolysis bullosa. Curr Opin Otolaryngol Head Neck Surg 2013;21(6):588-93. 4. Denyer J, Gibson E. Use of fibre dressings in children with severe epidermolysis bullosa. Br J Nurs 2015;24(6):38-40. 5. Jesus LED, Rangel M, Mauro-Filho RS. Urological surgery in epidermolysis bullosa: tactical planning for surgery and anesthesia. Int Braz J Urol2014;40(5):702-7. 6. Bıçakçı Ü, Tander B, Çakmak Çelik F, Arıtürk E, Rızalar R. Pilor atrezisi ve epidermolizis bülloza birlikteliği: İki olgu sunumu ve literatür derlemesi. Ulus Travma Acil Cerrahi Derg 2012;18(3):271-3. 7. Ksia A, Zitouni H, Zrig A, Laamiri R, Chioukh F, Ayari E, Sahnoun L, Maazoun K, Krichene I, Mekki M, Belghith M, Nouri A. Pyloric atresia: A report of ten patients. Afr J Pediatr Surg. 2013;10(2):192-4. 8. Stehr W, Farrell MK, Lucky AW, Johnson ND, Racadio JM, Azizkhan RG. Nonendoscopic percutaneous gastrostomy placement in children with recessive dystrophic epidermolysis bullosa. Pediatr Surg Int 2008;24(3):349-54. 9. Gollu G, Ergun E, Ates U, Can OS, Dindar H. Baloon dilatation in eusophageal strictures in epidermolysis bullosa and the role of anesthesia. Dis Esophagus 2017;30(3):1-6.